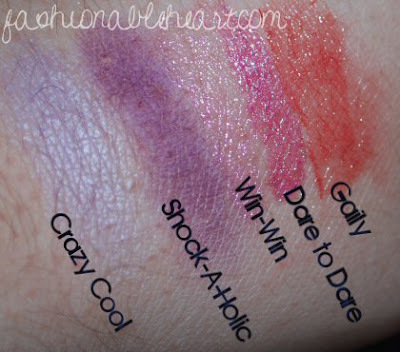 Crazy Cool and Shock-A-Holic eyeshadow from the Dare to Wear Collection. 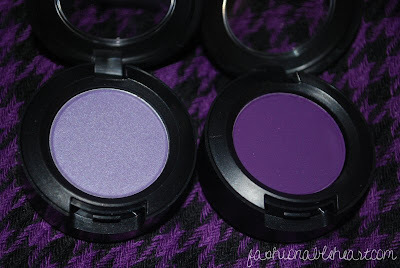 I am a sucker for purple eyeshadows. Crazy Cool is a Veluxe Pearl finish and is very sheer. It is best packed on with a fluffy eyeshadow brush. Shock-A-Holic is a Matte finish and is a cool-toned purple. 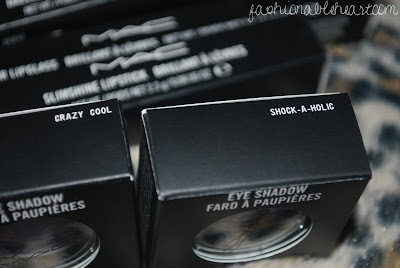 These two eyeshadows are not getting very good reviews, but I actually like them. I wore them both together yesterday and I really liked the outcome. Maybe the trick is to wear them together in one look! 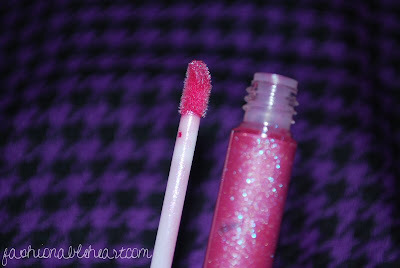 Win-Win Dazzle Lipstick from the Digi-Pops (Digi-Dazzle in Canada) Collection. These lipsticks are what Dazzleglasses would look like if they were in lipstick form. There is high shine and glitter. These are not for everyday use nor are they for everybody. The texture is not gritty, but I find that the glitter tends to migrate from the lips. 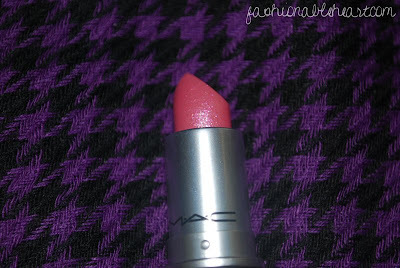 It's very sheer, but nice to layer over other lipsticks. Dare to Dare Lipglass from the Dare to Wear Collection. 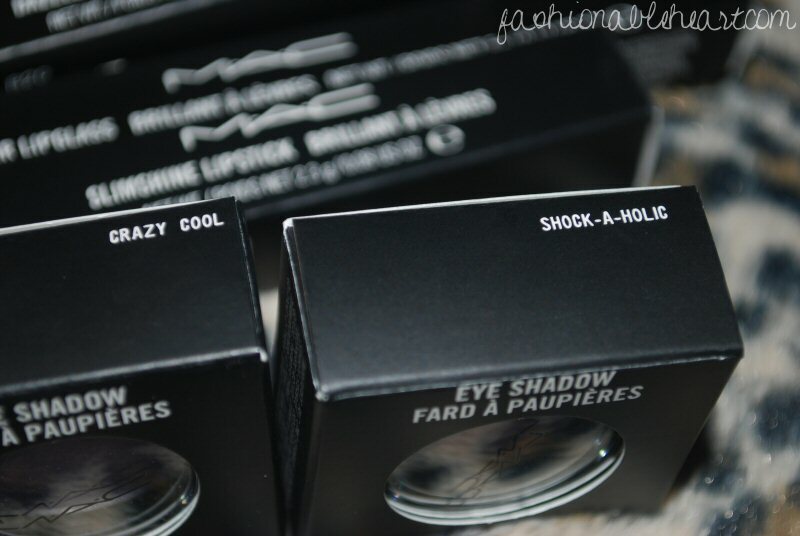 This lipglass is different from MAC's regular lipglasses because the bottle is much longer, leaning more towards looking like a Dazzleglass. The formula also feels different. It's as if a Dazzleglass and lipglass came together...a hybrid, perhaps. The pigmentation is better than many of the tinted lipglasses. Somehow I managed to completely forget to photograph Gaily Slimshine after the group photos. You can see the swatch above, though. It's a bit of a pinkish coral in shade and I think it will make for a nice fall lipstick. It's not too distant in color from the Lovey-Dove Slimshine I posted before, only Lovey-Dove has a slightly more reddish tone. Oh those purples are simply lovely. Makes me more excited for the purples in the Venomous Villains collection. Yay! i love the bay :) especially the eaton centre one. they have so many awesome counters there. like nars even! @Christine- Even better that we can use Air Miles to get Bay giftcards too! 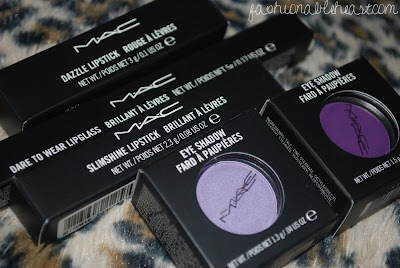 There is a purple quad coming out in the MAC Fabulous Felines Collection that looks similar to the one from the Spring Colour Collection. 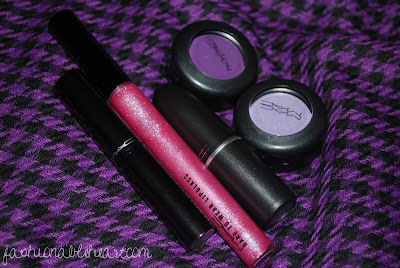 Really nice purple shades!